Obituary: Hazel Blankenship Gooden, 82, of Weeksbury, died Saturday, June 10, 2000, in the Pikeville Methodist Hospital, following a brief illness. Born on March 15, 1918, in Weeksbury, she was the daughter of the late W.M. Blankenship and Manilla Tackett Blankenship. She was a member of the Weeksbury Church of Christ. She was preceded in death by her husband, Sherman Gooden. Survivors include one brother, Bennie Blankenship, Prestonsburg; two sisters, Ladine Moore of Virgie, and Eva Mae Hall of Weeksbury. Funeral services were conducted Monday, June 12, at 1 p.m., at the Weeksbury Church of Christ, with the clergyman, Mike Hall, officiating. Burial was in the Blankenship Cemetery, Weeksbury, under the direction of Hall Funeral Home. Serving as pallbearers were Tim Blankenship, Phil Blankenship, Brad Hall, Eugene Blankenship, Ronnie Moore, James C. Justice and Chris Moore. 3. Estill Blankenship b 27 Apr 1921 Weeksbury, Floyd Co KY d 6 Nov 1986 Jackson Co OH (Norwalk, Huron Co OH); m. 14 Sept 1940 Robinson Creek, Pike Co KY to Mildred Johnson b 9 Jun 1923 Speight, Pike Co KY.
5. Ellen Blankenship b 21 Jul 1925 Weeksbury, Floyd Co KY d 28 Jul 1926 Weeksbuty, Floyd Co KY; age 1 year; buried Tackett Family Cemetery, Weeksbury, Floyd Co KY.
6. Eva Mae Blankenship b 17 Nov 1926 Weeksbury, Floyd Co KY d 24 Jun 2002 Weeksbury, Floyd Co KY; buried Blankenship Cemetery, Weeksbury, Floyd Co KY; m. 13 May 1943 Gulfport, Harrison Co, MS, to Sid Hall b 19 Dec 1921 Weeksbury, Floyd Co KY d 15 Aug 1985 Weeksbury, Floyd Co KY; buried Blankenship Cemetery, Weeksbury, Floyd Co KY; s/o Thomas Hall and Millie Hun Johnson. iv. Diane Blankenship; m. Jimmy Fish. Obituary: BLANKENSHIP, Bennie Franklin Age 73, of Prestonsburg, passed away Monday, December 9, 2002, at the Highlands Regional Medical Center, following an illness of one year. He was born December 18, 1928, at Weeksbury, a son of the late William G. and Manilla (Tackett) Blankenship. 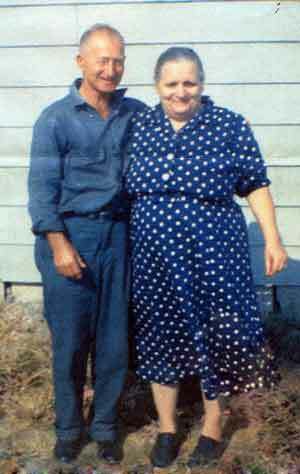 He was married to Wanda (Fleming) Blankenship, who survives him. He was the minister of the Prestonsburg Church of Christ. 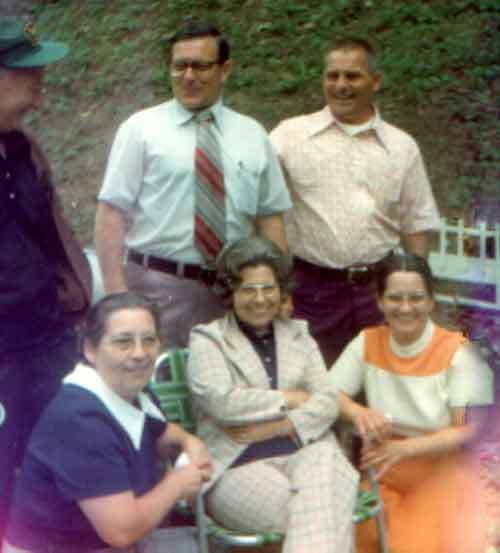 He is survived by three sons and their wives; one daughter and her husband, Darrell and Brenda Blankenship of Mount Juliet, Tennessee; Phillip and Greta Blankenship of Witchita, Kansas; and Timothy and Caroline Blankenship of Prestonsburg; Diane and Jimmy Fish of Prestonsburg; one sister, Ladeane Moore of Virgie; and six grandchildren. Funeral services will be conducted Thursday, December 12, at 1 p.m., from the Prestonsburg Church of Christ, with Evangelist Greg Johnson officiating. Burial will follow in the Davidson Memorial Gardens at Ivel. Visitation will be at the Prestonsburg Church of Christ; Wednesday, from 10 a.m. to 9 p.m., and Thursday, from 11 a.m. to 1 p.m. Active pallbearers will be the elders and deacons of the Prestonsburg Church of Christ. Honorary pallbearers will be all men of the Prestonsburg Church of Christ. All arrangements under the direction of Burke Funeral Home, Prestonsburg.